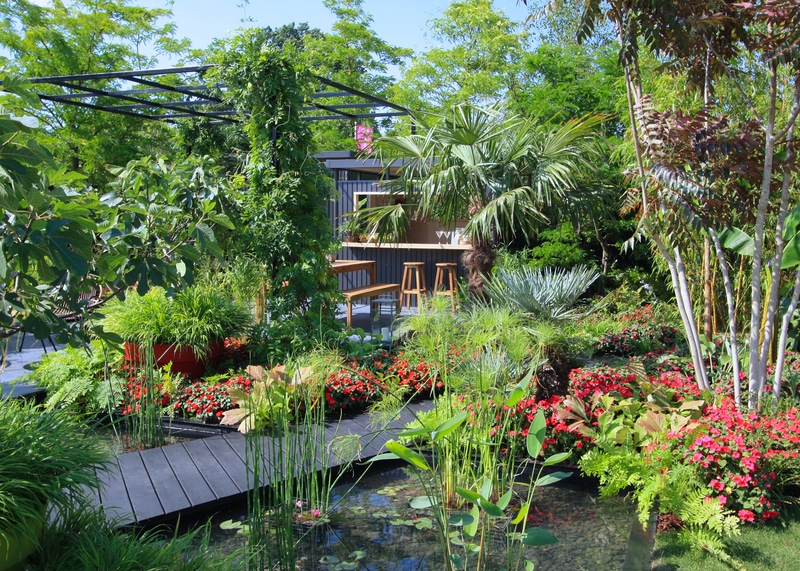 Who would have imagined that a garden jam-packed with common-or-garden Busy Lizzies would win a gold medal the prestigious Hampton Court Palace Flower Show? Or that such a garden would land Best in Show and the ultimate horticultural accolade, The Tudor Rose Award? 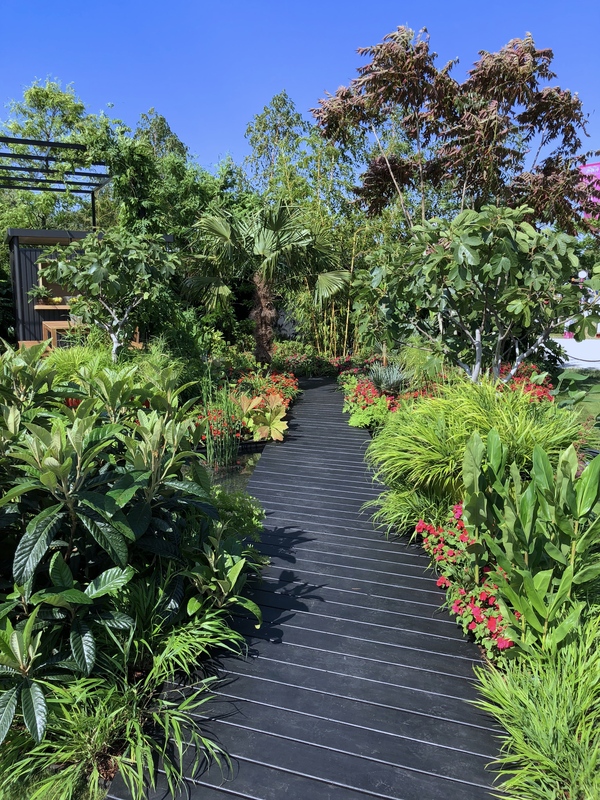 Well, thanks to talented designer Matthew Childs and a partnership between DIY giant B&Q and plant breeder Syngenta, such a garden just has …. and it richly deserved to. Since 2011 the poor old Busy Lizzie, stalwart of hanging baskets and window boxes across the temperate world, tolerant of shade and flowering for months on end, has been struck down by a virulent strain of downy mildew. The disease cannot be controlled by fungicides, consigning one of our favourite garden and house plants to the B list of bedding. Acknowledging the problem, and the popularity of this forgiving little plant, B&Q and Syngenta have brought to market a new breed of Busy Lizzie called ‘Imara’, which means ‘strength’ in Swahili. Not only are ‘Imara Bizzie Lizzies’ highly resistant to downy mildew, but they are also adaptable to sun or shade and will flower from late spring until the first frosts. To me, they appear unrecognisable from the plants we knew and loved before pestilence struck. This is all great news, but it requires a stretch to imagine Busy Lizzies starring in the top garden at the Hampton Court Palace Flower Show. Yet from the moment one rounds the corner and catches sight of this expansive garden, one recognises it as a winner. It’s been a hot, bright show so far this year and the heat really makes this vibrant space quiver with energy. Rich, saturated greens of musa, ficus, aucuba, hosta, canna and osmunda zip and ping in front of graphite-grey hard landscaping elements. Pops of gold, acid-yellow, silver and plum prevent the composition from becoming a monotonous sea of green. Then come the Busy Lizzies in feisty shades of red, orange, magenta a purple, fizzing and popping beneath a leafy canopy, just as they would in the forests of East Africa. The plants were deliberately grown taller for the most shaded parts of the garden to mimic their natural habit as a woodland understory plant. I especially love a section where a mass of cherry-red Busy Lizzies is shot through with pale yellow Virginia wild rye (Elymus virginicus). Apart from a couple of waterlilies and hostas, Busy Lizzies are the only flowers in this garden. What is clever about the design is that it offers varied and interesting views from the outside in, deftly demonstrating the power of the diagonal in creating depth and the illusion of greater space. Nothing infuriates me more than a show garden that cannot be appreciated from its perimeter. This is why I had no great appreciation for Chelsea’s Best in Show, which appeared to be designed almost to the exclusion of the outside viewer. 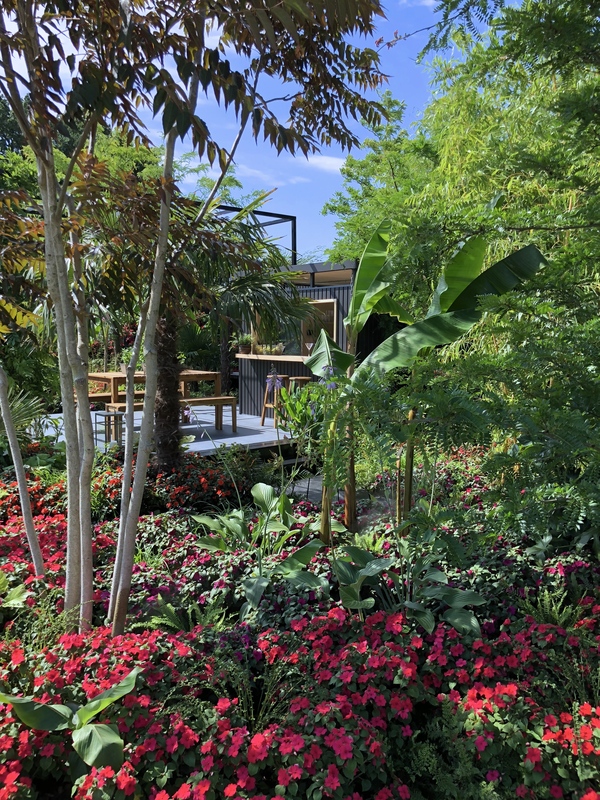 This is all well and good in a private garden, but not at a flower show: there’s something not very inclusive about a show garden that looks in on itself. 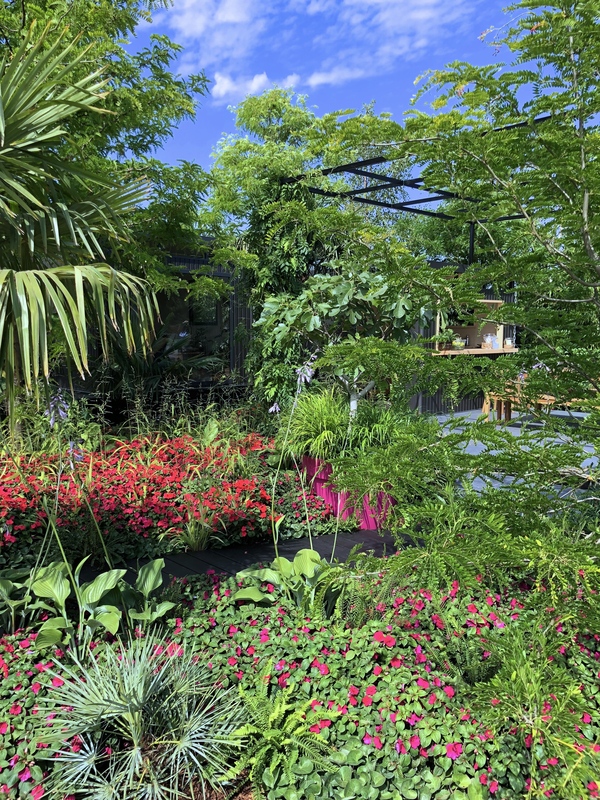 Matthew Childs’ garden is exciting from every angle, the saturated colours refusing to pale in even the brightest of sunlight. A stiff breeze added to the exotic feel on Monday … as if a tropical storm had just blown through. Water is incorporated boldly and seamlessly, dotted here and there with Thalia dealbata and Cyperus papyrus, which are tender but fabulous pond plants. A feature in at least three show gardens this year, an outdoor bar suggests infinite entertaining opportunities. There is even the option to retire to a small studio with a bed inside, should all the socialising get too much for you. Surprise, surprise, all the materials used are available to buy at B&Q and that in itself will be a revelation to some. 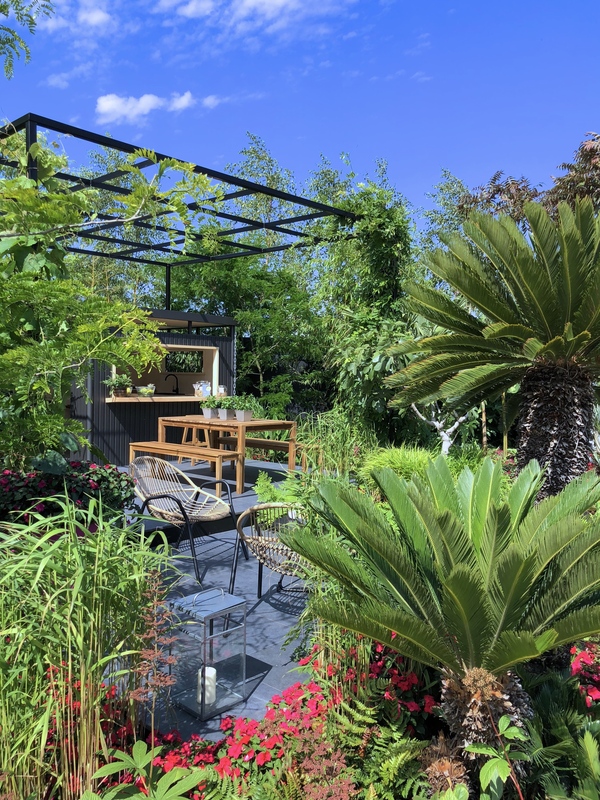 It is hard for the other show gardens to compete with the scale and sheer exuberance of the Bursting Busy Lizzie Garden, but the accolades are genuinely deserved for the quality of the build and the imaginative design alone. 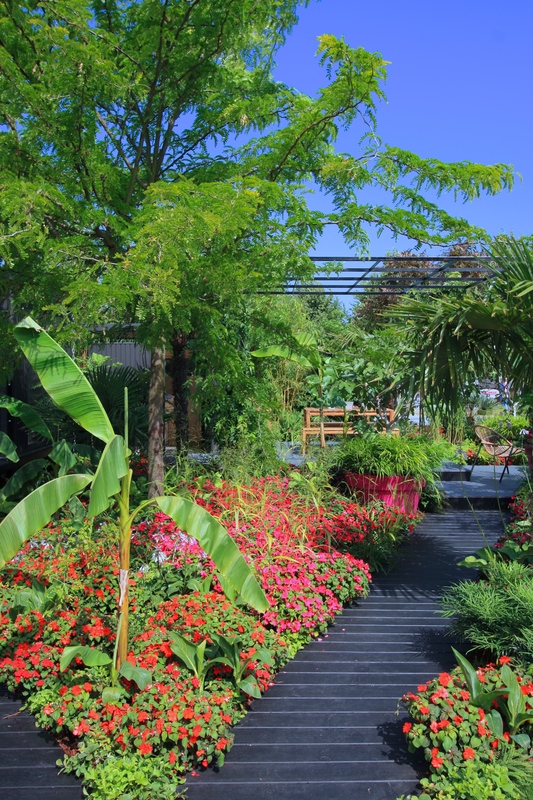 The scale of the structural planting, including mighty specimens of Ailanthus altissima ‘Purple Dragon’ (tree of heaven) and Gleditsia triacanthos ‘Sunburst’ (honey locust), mean that every last bit of attention is captured by the garden and not by the RHS’s ugly tents and flags. Of course this design was always going to appeal to me with my love of bright colours and tropical foliage, but I was not alone. I would be no surprise if it were to land People’s Choice and secure a clean sweep of the top awards. To sum up this is a garden that both a passionate gardener and a socialite might enjoy. 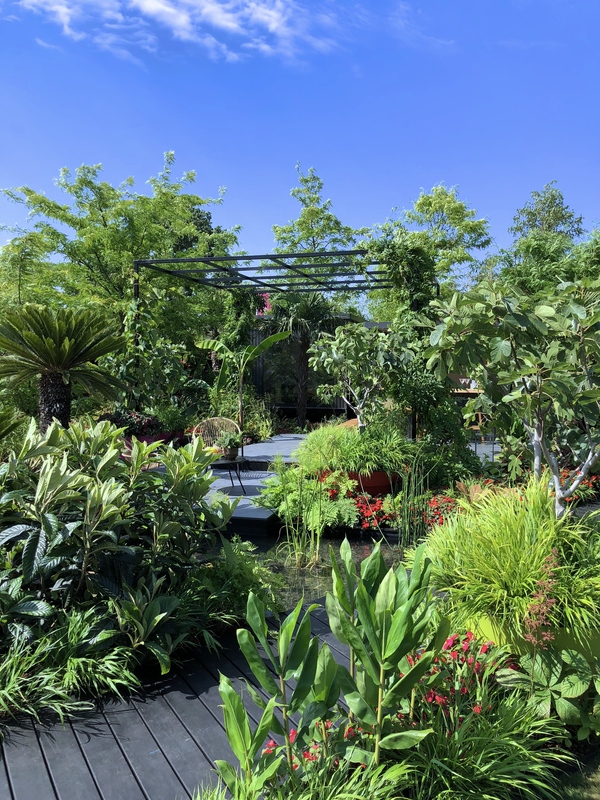 It could be adapted to be high or low maintenance, although I should note that the tender nature of some of the planting, including cycads, bananas and Busy Lizzies, mean it would take some revision for a more northerly location. The majority of plants used would overwinter outside with some care. Whilst the hard landscaping elements seem appealingly affordable, the larger plants certainly would not be, unless one was prepared to be patient. The consolation is that many would be fast growers. It’s great to see the Busy Lizzie restored to health and, one hopes, to our gardens. I have relied heavily on white-flowered varieties in previous gardens and marvelled at their willingness to grow neatly and flower abundantly. If you still have any gaps left (and heaven knows I don’t! ), get to B&Q, snap up some some ‘Imara Bizzie Lizzies’ and let us all know how you get on. TFG.